Reading recipes, planning and then cooking a meal together can help English learners in many valuable ways, expanding their vocabulary, encouraging discussion, and improving their ability to give and take instructions. In addition, a hands-on cooking activity offers ESL students the opportunity to understand oral communication and pose spontaneous questions within a structured situation. By introducing cooking activities into your classroom, English language learners are directed to pay attention to the names of food, preparation instructions, simple recipes, courses of the meal, package descriptions (ingredients, expiration date, weight, and serving size, storage instructions, nutrition information, etc.) As an added benefit, it adds a cultural awareness of western-styled food and meals. Here are some recommended on-line resources ESL teachers can look to when selecting their recipes and compiling ideas for cooking and food related activities. Dave’s ESL Café Idea Cookbook provides a comprehensive list of words used in cooking. Karin's ESL PartyLand features a fun menu-reading activity that will encourage ESL students to practice their English vocabulary, reading and writing skills while they look at a menu from an American restaurant. ManyThings.org utilizes a fun online game of hangman to help students learn food- and drink-related vocabulary. It wouldn't be Thanksgiving, without dessert. The website where this Pumpkin Bar recipe comes from focuses on vintage Thanksgiving dessert recipes – just like grandmother used to make. We've chosen pumpkin bars as they will give that classic taste of Thanksgiving traditions, but are much simpler to create in a classroom setting than pumpkin pie. CircleTime Kids features easy and quick recipes for various U.S. holidays. Corn is an iconic and enduring staple among all the Americas, and these Corn on the Cob cupcakes end up looking like the real deal, but are easier, and more fun, to make than corn on the cob. Disney's Spoonful website offers easy-to-make recipes that can be adapted easily to the classroom. Take a look at these Thanksgiving appetizers in the Fall Recipes section and you'll quickly spot some creative, fun and simple recipes. In situations where you do not have access to a cooking facility, optional cooking situations can be sought. Can you use the school kitchen in the off-hours? Depending on the recipe and age of the students involved in the cooking activity, can you get permission to bring in a hotplate for boiling or frying; a small microwave appliance, or a toaster oven for baking? For an absolutely no-cooking-required option, ESL teachers might consider a food-related activity that involves the presentation of English-language television cooking shows. These shows can be ideal for classroom use because of their short segments and predictable step-by-step structure which you can use to help students focus on developing general listening, as well as comprehension and specialized vocabulary, and speaking skills. For a great selection of videos featuring autumn recipes like toffee apples, pumpkin soup, and apple crumble, check out Videojug. Most videos run two to four minutes in length and are perfect for starting, stopping and repeating as needed. The Food Network is a huge site that offers both videos and clips from their television shows, as well as numerous recipe videos, printable recipes and party ideas. Here are some links to both the Halloween section and the Thanksgiving section to get you started. Creating shopping lists and ordering food from a restaurant are natural follow-up activities that can also enhance the study of the English language. No matter what approach you take, the introducing a cooking activity into the classroom will help students make cultural connections and reinforce their everyday English language skills across academic disciplines like mathematics, language arts, and social sciences. Planning and cooking American recipes together, as an ESL classroom activity, can be a great way to enjoy good food while learning English! 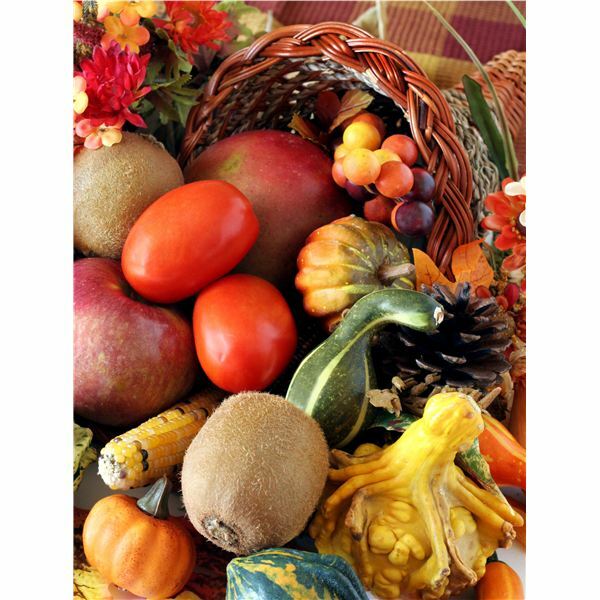 Part of a series of four seasonal articles with food and activities for ESL students.